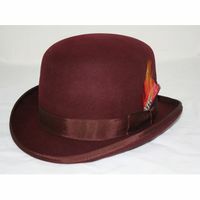 Mens Derby hats have a way of bringing you back in time to a more simpler but well dressed era. Depending on which side of the pond you hail from, you're going to call it one name or the other. 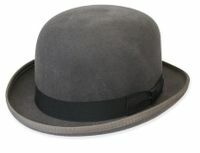 If you're from England or part of the UK you're going to call this a Bowler hat. If you're from the States, this is called a Derby Hat. 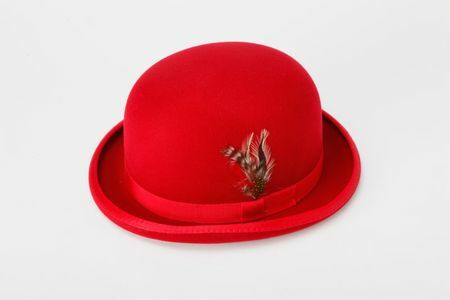 Either way this is a dress hat that was originally created in the mid 1800s for an English Man who favored a dress hat that was made of a stiff Felt and not the soft type that lower classes of the day wore. A Derby hat always signified a man of means as opposed to a man who got his hands dirty for a living. These look quite a bit different from a Homburg Hat. Back in the old days, the upper classes would never ever be seen doing any type of labor and the Bowler or Derby Hat would signify this type of demeanor. The hat became very popular for men who favored wearing overcoats when out and about on the town because this particular type of dress hat had a certain undeniable style about it that men of the upper classes favored.